Welcome to January a month of dark days, chilly evenings and new starts. For many people this means making new goals when it comes to health and wellness. As you know I lead a healthy lifestyle and I am pretty obsessed with green juices. For January I have set a few intentions but I also wanted to get back into the habit of drinking a daily juice. 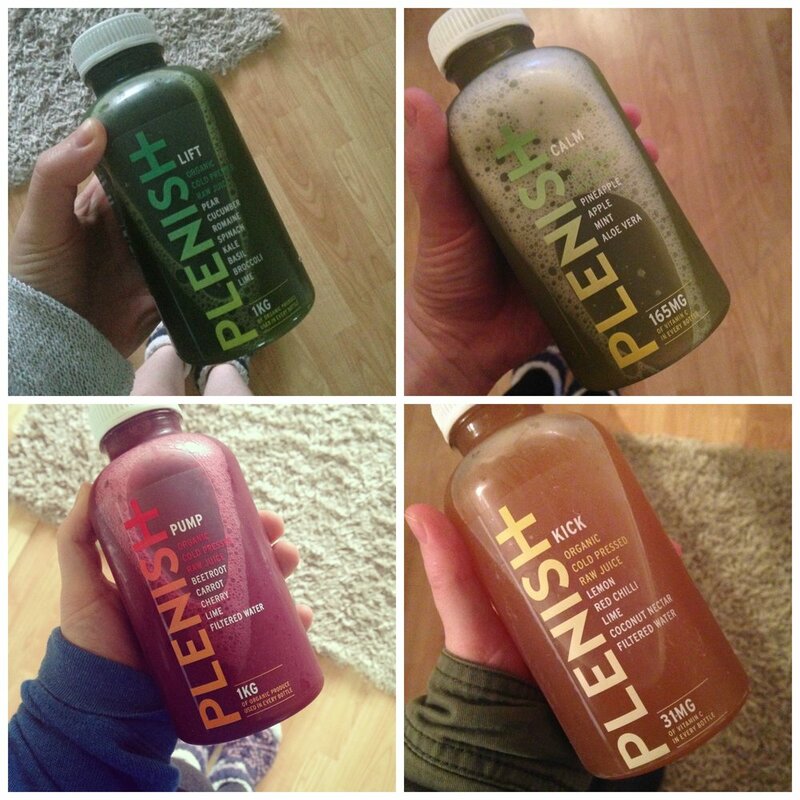 Plenish Cleanse offered to send me some of their juices to try and if you have been following me over on Instagram then you will have seen a few of the juices I have been drinking! There are a couple of ways you can incorporate juices into your life. You can do a cleanse where you only drink juices for 1 to 3 days - I'm not a nutritionist so I can't advise you on this but personally I wouldn't do this. What I like to do is begin my day with a juice along with a huge glass of water, later in the morning I will make myself a breakfast of scrambled eggs. I have my lunch as normal which is usually a veggie based dish. Later in the afternoon I will drink a second juice for an energy boost. If it's a weekday I am usually teaching yoga in the evening so I will head out to teach, when I get back home I will make myself a light supper. On a side note, if you would like me to do a 'What I Eat in a Day' style post or video then let me know in the comments! The key to eating healthy is very much BALANCE. Cook from scratch, eat more vegetables, if you eat meat or fish make sure it is responsibly sourced, buy organic where you can. I also cut out dairy as I have an intolerance. Lastly make sure that you HYDRATE, you want to aim to drink half your body weight (in pounds) in ounces of water a day. I've currently been using the Tara Stiles Make Your Own Rules Cookbook recently and I love it! The juices arrived early in the morning in a cooler bag which meant they were icy cold and could be popped straight into the fridge. I didn't drink the juices in any particular order just which ever I was in the mood for at the time. The juices are organic, cold pressed raw juices which means the people at Plenish create the juices by placing the high quality, organic ingredients under pressure instead of heat. This means that the final product stays raw, delicious and packed with nutrients - which is what you want to look out for if buying pre-made juices. I loved the green juices (well duh! I'm obsessed!) - LIFT contained pear, cucumber, romaine, spinach, kale, basil, broccoli and lime. It was energising and refreshing. CALM was just that, very refreshing and calming, I drank this one just before setting off to teach one of my yoga classes. It contains pineapple, apple, mint and aloe vera. The following morning I woke up and grabbed the KICK juice out of the fridge thinking it would be the perfect 'wake me up' before teaching my morning yoga class. Well I wasn't wrong! This juice contains lemon, red chilli, lime, coconut water and filtered water. This juice was a little on the spicy side for me and I found the chilli overpowering. I really liked the majority of the juices, the only one I wouldn't have again is the KICK juice as the chilli was just too much for me! I felt full of energy and revived after a few days of drinking a juice twice a day alongside my regular healthy meals. I feel balanced again after eating a little bit too much chocolate over Christmas. If you are based in London Plenish have taken over Whole Foods Kensington for the month of January and are running Power Brunches. There are goodie bags, a light brunch and juices available to try so be sure to pop down. What are your thoughts on juices? Have you done a cleanse before? Let's talk! Before you go - My March Yoga Retreat in Devon is booking up and I have limited spaces left! Don't miss it! I have an amazing active wear brand secured for the goodie bags too which makes it all the more exciting to share!